Bankrupt Pacific Gas & Electric Corp. inched closer to taking responsibility for the deadliest U.S. wildfire in a century, saying Thursday it is "probable" that one of its transmission lines sparked the blaze last year that killed 86 people and destroyed most of the city of Paradise. Anoushah Rasta reports. The embattled utility company, which filed for bankruptcy protection in January, said it's taking a $10.5 billion charge for claims connected to the so-called Camp Fire in its fourth quarter earnings. The fire destroyed 14,000 homes in and around Paradise — a city of 27,000 people in the Sierra Nevada foothills. The cause of the fire, the deadliest in California history, is still under investigation. 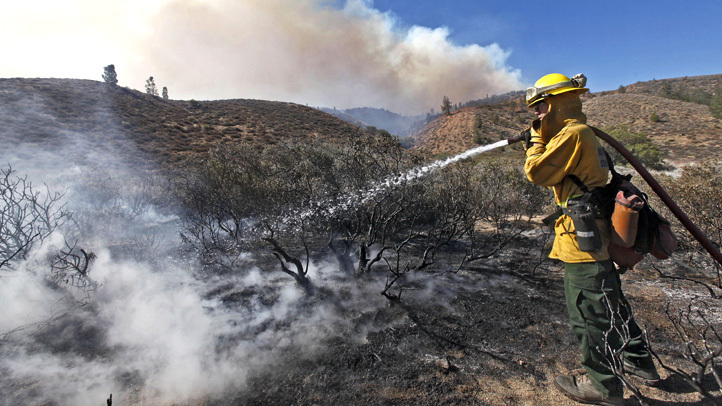 But firefighters located its start near a tower on PG&E's Caribou-Palermo transmission line. PG&E has previously acknowledged that that transmission line lost power right before the fire and was later found to be damaged. It also included the blaze among the more than $30 billion in potential wildfire liabilities it said it was facing when it announced plans to file for bankruptcy in January. acific Gas & Electric says its equipment may have ignited the 2018 Camp Fire, which killed 86 people and destroyed an entire town in Northern California. Kris Sanchez reports. "We recognize that more must be done to adapt to and address the increasing threat of wildfires and extreme weather in order to keep our customers and communities safe," said John Simon, interim CEO of PG&E, in a statement. "We are taking action now on important safety and maintenance measures identified through our accelerated and enhanced safety inspections and will continue to keep our regulators, customers and investors informed of our efforts." PG&E also recorded a new $1 billion charge related to 2017 wildfires in Northern California. Citing extraordinary challenges from wildfires, PG&E's management concluded the circumstances "raise substantial doubt about PG&E Corporation's and the Utility's ability to continue as going concerns." PG&E also said there was an outage and downed wires in another location, called Big Bend, on the morning of the Camp Fire. While fire officials have identified the second location as another potential ignition point of the Camp Fire, PG&E said it's unsure if that problem might have ignited the fire. The Caribou-Palermo transmission line has been out of service since mid-December, and inspections have identified equipment that needs repair or replacement, the company said.